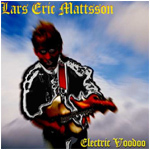 Electric Voodoo, (also released in the United States as "The Exciter") and known in some circles as Electric Woodoo", blends hard rock and neo-classical metal in the European tradition, as Finnish guitarist Lars Eric Mattsson plays impossibly fluid lines over ten pumping, metallic rhythm tracks. Drawing from influences such as Uli Jon Roth, Michael Schenker and Paco De Lucia, Mattsson straddles the line between finesse and fury, and between passion and aggression. Electric Woodoo also finds Mattsson playing all the instruments, augmenting his fretboard wizardry with keyboards, electric percussion and bass. High energy instrumental statements. • The Cry of Love. • Sacrifice of Love (1998 bonus track).